It was one of those nights when I just did not feel like making anything that took a very long time. Oh wait… that would be almost every night. Nevertheless, I assure you that this night I really meant it. Anyway, I did not have much in the fridge, but I did have some eggs and some Italian sausage I had to finish, so I decided to make this very special omelette-y pizza. My husband looked dubious about the whole thing (he’s not a huge fan of omelette for dinner) but in the end he volunteered himself in saying it was “very good,” which (coming from my husband) was quite a compliment! 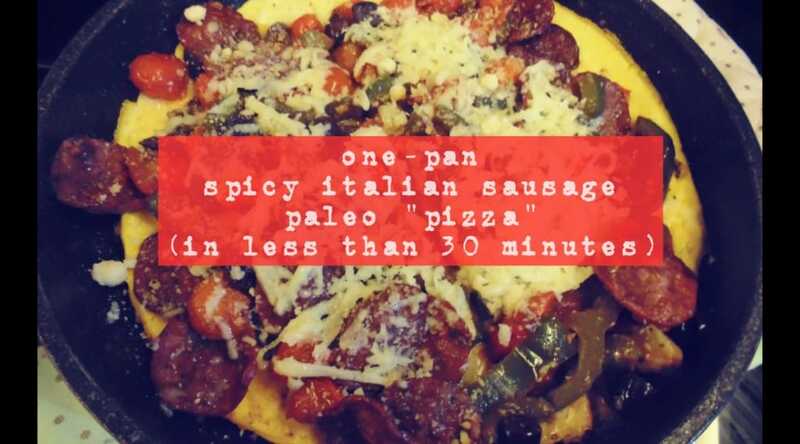 This “pizza” is easy, delicious, heavy-laden with nutritious vegetables, great for breakfast lunch or dinner, and comes non-paleo-lovin’ husband approved. Born and raised in Australia, married to an American, living in Singapore and learning how to live a healthy and balanced life wherever I go! I love to talk about my faith, family, food and fitness almost incessantly--these are my passions in life. It has been told me that at least half of all the conversations I engage in are about food... which is probably true. Put one glug of EVOO in a pan on a medium heat. Put sausage in pan and cook until browned. Add crushed garlic and stir around for about half a minute–until aromatic. Add all the vegetables and olives and continue to stir occasionally until the vegetables are cooked through (5-10 minutes). Once done, remove and set aside.Wipe out pan. Add a little bit more EVOO and turn to medium-low heat. In a bowl, whisk eggs with a little salt and cracked pepper. Pour into pan and place a lid on top, then turn the heat down to low and leave until the eggs are cooked almost to the top. Put a small handful of the mozzarella cheese on top of the eggs in the pan. Place sausage and vegetable mix on top of the eggs and then top with a little more mozzarella and Parmesan. Cook for 1 minute on low with lid on to melt cheese. Serve with a large side of mixed salad and enjoy it with Tabasco sauce for an extra kick! Over the past years, my friend Dave at Paleohacks has been working on a secret cookbook with world-renowned Le Cordon Bleu chef Peter Servold. 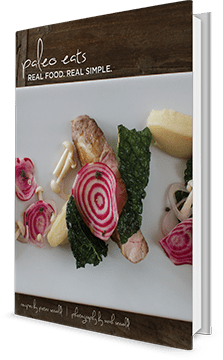 That's right — as a special launch promotion, we're offering our brand new Paleo fat loss cookbook to you for free (Chef Pete lost 60 lbs using these recipes!) — All you have to do is just cover a small shipping cost (international shipping is a bit more).